Companies worldwide face the challenge of continuously engaging their employees, customers, and key stakeholders in their organizational activities. Rallyware empowers its customers to coach, train, and motivate their workforces through personalized scalable engagement programs that achieve higher sales, faster employee onboarding, increased participation in corporate initiatives, and other business objectives. 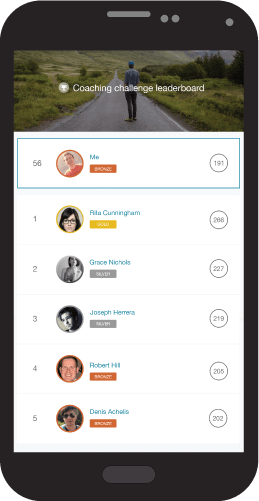 Our mobile and web platform drives online and offline activities by creating a game-like social user experience. Rallyware comes with a suite of predefined engagement programs proven to drive desired business objectives for a variety of industries and use cases. Customers can customize predefined programs or build their own to gradually build up employee confidence and skill sets by starting with easy tasks and progressing to more complex activities. As participants complete tasks, they earn points and engage in friendly individual and team-based competitions with their peers. They also unlock virtual badges for successfully completing key challenges and reaching milestones, while management has the ability to reward top performers with real-life rewards. Simplified communication among the program participants increases their engagement around the activities and instills the sense of community consisting of their peers across different geographies, departments, and interest areas. It also provides an ability for the management to quickly disseminate important information targeted to the specific groups of participants. Real-time tracking and analytics dashboards uncover critical insights into workforce success, empowering corporate leaders to see and influence how field engagement impacts key performance indicators (KPIs) and user retention. 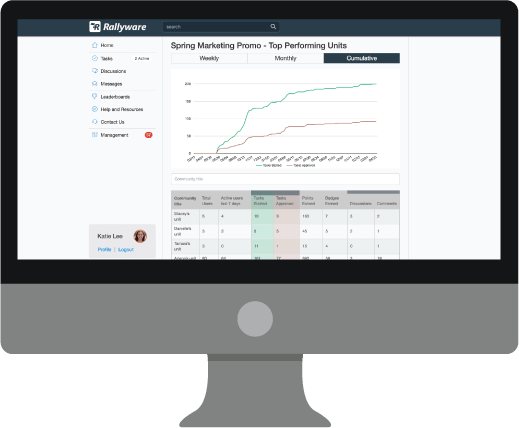 Getting started with Rallyware is easy. We take ownership of the entire process, and all you need to do is provide us with relevant information and sign off on deliverables. A typical implementation takes 4 weeks and requires ~10 hours of your time.